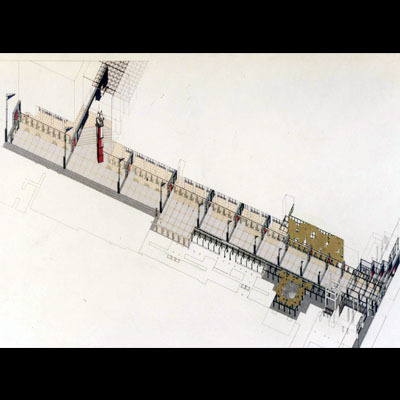 This project had two parts: 1) a master plan re-organization of the ground floors, 2) a design of the street as a 'campus-walk' to give the school an identity and a a sense of place. A ULURP approval for a limited access street-closing was obtained but the project was put on hold for dormatory construction and fundraising. It received a Prograssive Architecture Award in 1985 and extensive publication in Parametro in 6/84.